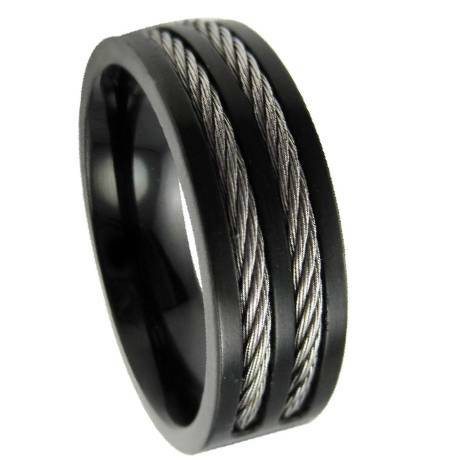 This ring, boldly elegant with its monochromatic theme, dynamically contrasts textures while maintaining gentlemanly simplicity.Its dual wire bands set against black steel imbues a simple beauty with their clean lines, yet the twining metal fibers ensure a splash of sophistication and allure. I ordered this ring along with another. I received the shipment notification the next day. The rings came in about 2 weeks. The cable ring was slightly scratched when I received it. I sent customer service an email asking how to properly care for this ring and they gave me a full refund! Although the refund was not necessary it was greatly appreciated. Other than the scratch, the ring is great. The size and quality of the ring is good. Customer service is great. This ring is awesome. Superior quality and looks great. Just like the picture. We were very impressed, esp after ordering a different one from this site first that we were disappointed with. It's well worth the money and more. My husband loves it and wears it all the time. He preferred this to a more expensive wedding band because he is rough on jewelry as an officer. So far no issues. Very happy with this purchase.